Olaf Engvig - The Scandinavian Navy: The Ships That Built the West. 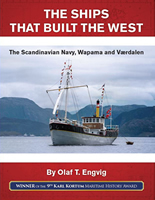 Olaf Engvig has published English and Norwegian editions of his new hardcover book: The Ships That Built the West: The Scandinavian Navy, WAPAMA and VÆRDALEN. Read stories of the "Scandinavian Navy" and its impact on the U.S. Pacific coast, and two very different tales of two historic ships. Learn more! Engvig's friends and helpers wanted to celebrate the completion of the VÆRDALEN's restoration with a postal stamp for cards and letters sent within Norway. This was issued by the Norwegian Postal Service. Idea, concept and design: Ole Haugerudbråten, Knut Petterson, Gunn Engvig and Håkon Engvig. This is the oldest known photo of the VÆRDALEN and shows 2 sailors painting her in 1916. The ship was 25 years old. The Ships That Built the West: The Scandinavian Navy, WAPAMA and VÆRDALEN. Purchase The Ships That Built the West: The Scandinavian Navy, WAPAMA and VÆRDALEN. 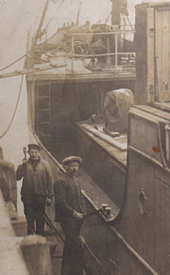 Olaf Engvig's latest book tells the stories of the "Scandinavian Navy", namely, ships and/or seamen from Denmark, Finland, Iceland, Norway and Sweden in the 1880 - 1945 time period. The US West Coast was built with the help of these ships and men, especially by providing lumber for improving the infrastructure of the US. You'll read about the sagas and very different endings of two Scandinavian ships. The steam schooner WAPAMA once was the main vessel on display in a San Francisco museum, Then you'll experience the personal trials and tribulations over the decades of Olaf Engvig striving and succeeding to rescue the hybrid ship VÆRDALEN, now the sole survivor representing the famed Scandinavian Navy lumber carriers. Olaf Engvig's The Ships That Built the West: The Scandinavian Navy, WAPAMA and VÆRDALEN is the winner of the 9th Karl Kortum Maritime History Award, a program of the Friends of Pacific Maritime History! See a PDF excerpt from the beginning of the book, namely the table of contents and the foreward. You'll notice that the book is divided into 4 sections: The Scandinavian Navy, the WAPAMA, the Last Hybrid Ship VÆRDALEN, and Iron in Ship Building. Within the Scandinavian Navy section, you'll learn how Scandinavian the ships and seamen were, what life was like on a ship, what the Sailors' Union of the Pacific was, the 1915 Panama Pacific International Exposition, the challenges of the Emergency Fleet, and more information about ship owners and captains. The WAPAMA was built in 1915 to carry a million board feet of lumber plus 60 passengers. She was the last generation of lumber schooners. On the inside she looked like a miniature ocean liner, complete with an elegant mahogany-paneled salon and a grand double staircase (right) leading to a state-of-the-art dining room. But she was built and operated as a lumber and cargo carrier. An advantage of this design was that she could deliver lumber and take on passengers at ports that didn't have regular passenger service. She also was a ship familiar with smuggling, gambling and prostitution, since illegal activities on water were easier to get away with than on land. At the end of her working life, the WAPAMA was restored and became the jewel of the San Francisco ship collection, on display for many years. She was declared a National Landmark. But outdoor life is hard on a wooden ship when nobody is doing maintenance. Many efforts were made to procure funding for restoration, maintenance and an indoor location to stop the deteriorization of this piece of maritime history. You can feel the anguish of Olaf Engvig and other supporters of maritime history as the story of the WAPAMA unfolds. The VÆRDALEN is the last existing lumber schooner. Built in Norway in 1891, she's had a storied career. The design was more like an American lumber carrier of the late 1880s, and was considered an odd shape to Norwegians. 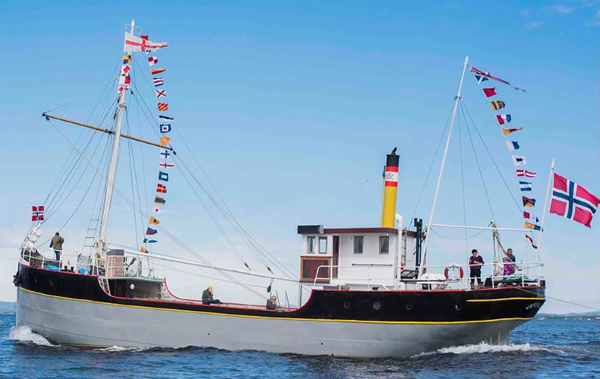 Certified to carry about 32,000 board feet of lumber, she's constructed from iron and steel, and has both a sail and small steam engine driving the propeller. 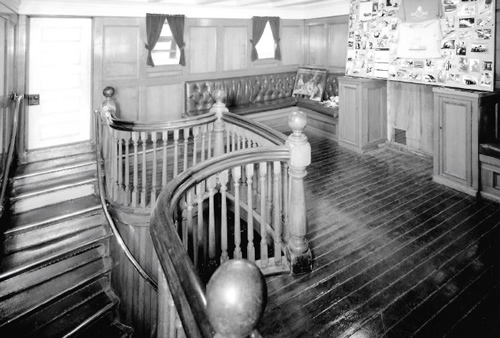 Spaces included a passengers' lounge, captain's cabin, galley, toilets, storage spaces, sailors' cabin, a second-class cabin, and a postmaster's cabin. The fine mahogany lounge furniture was original from 1891. 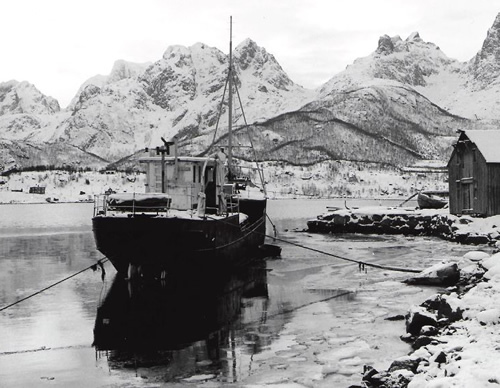 The VÆRDALEN and her sailors experienced interesting lives during World War II. In 1946 her owner utilized the VÆRDALEN as a backup ship, but then sold her since there were now more efficient ships. A few more ownership transfers ensued; she was still working when she was more than 86 years old. Abandoned and scheduled to be filled with rocks, she was abused by theft, graffiti, weathering and a general lack of care. 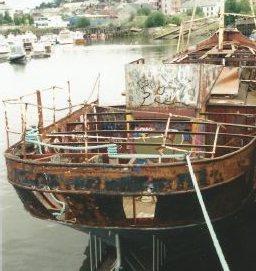 Shown left, the old hull below deck was sturdy, in spite of the deterioration above. Shown below, VÆRDALEN in winter of 1979, rediscovered in a remote part of northern Norway. The story of her eventual restoration by Olaf Engvig is a tale of emotional highs and lows, friendships, luck, persistence, gatherings of like minds, and philosophical questions about what historical items societies value. The final section of The Ships That Built the West includes facts about iron ship building relevant to the WAPAMA and VÆRDALEN. One of Olaf T. Engvig's main areas of research is the use of iron in ship building (see information on a previous book, Viking to Victorian: Exploring the Use of Iron in Ship Building). Preserved old iron ships show that ship quality iron from the middle of the nineteenth century has had much better endurance over time than newer and originally better quality steel.